Prototype: Class 01.5 steam express locomotive with a oil tender. GDR German State Railroad (DR/GDR) "Reko" version. Includes boxbok wheels and a large type T34 standard design oil tender, special design with Witte smoke deflectors and continuous dome streamlining with inductive magnets on both sides. Road number 01 519. The locomotive looks as it currently does in 2016. Model: The locomotive has an mfx+ digital decoder and extensive sound functions. It also has controlled high-efficiency propulsion with a flywheel, mounted in the boiler. 3 axles powered. Traction tires. The locomotive and tender are constructed mostly of metal. The 7226 smoke unit can be installed in the locomotive. The triple headlights change over with the direction of travel. They and the smoke unit that can be installed in the locomotive will work in conventional operation and can be controlled digitally. The cab lights can also be controlled digitally. Maintenance-free warm white LEDs are used for the lighting. There is a close coupling with a guide mechanism between the locomotive and tender. There is a close coupler with an NEM pocket and a guide mechanism on the tender. The minimum radius for operation is 360 mm / 14-3/16". Protective sleeves for the piston rods and brake hoses are included as detail parts. Length over the buffers 28.2 cm / 11-1/8". A small brochure on the history of road number 01 519 and its restoration is also included. For still more operating enjoyment in the Marklin "World of Operation"
On Friday September 21, 2018 the 14th MHI member meeting took place in Uhingen (near Göppingen). 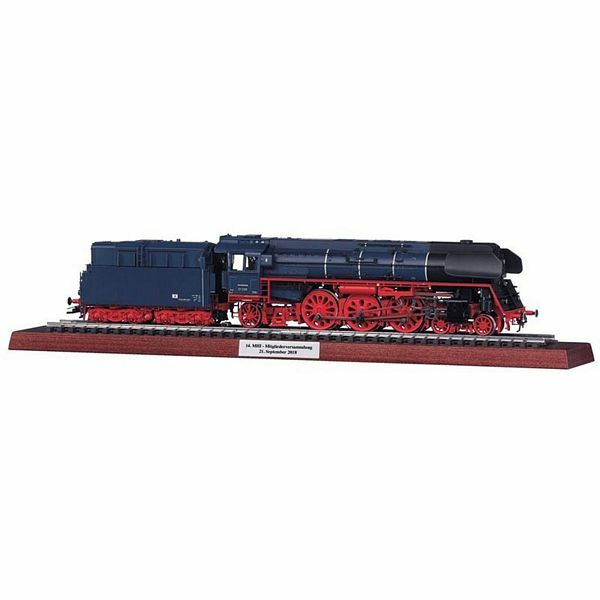 On the occasion of this meeting the MHI ordered a special model in a limited series from Marklin. Digital locomotives with high-efficiency propulsion. Maximum speed and acceleration / delay are adjustable. Special motor with electronically enhanced load compensation or a compact bellshaped armature. Can be operated with Marklin transformers, in the Marklin Delta system or in the Marklin Digital system. One controllable auxiliary function (function), when the locomotive is being run in the Digital system.